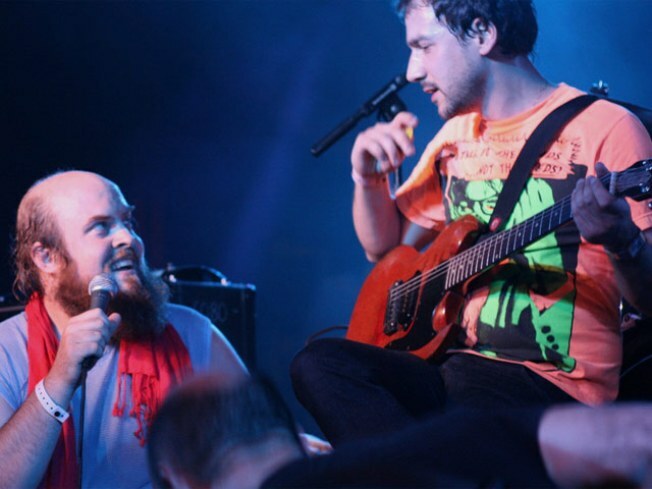 Tim Harrington and Seth Jabour of Les Savy Fav. - Indie rockers Les Savy Fav with opening act the Vivian Girls (lo-fi post-punk!) @ Howard Gilman Opera House on 1/29 at 8PM. Tickets: $20, 25. - Rain Machine (bluesy side project of Kyp “Mad Falsetto” Malone, guitarist-singer for art-rockers TV On The Radio with opening act alt.hip-hoppers Anti-Pop Consortium @ Howard Gilman Opera House on 1/30 at 8PM. Tickets: $20, 25. - The Sweet Divines, bringing their tight, throwbacky girl-group harmonies to the BAMcafé on 2/6 at 8PM for a free show. - Baroque popsters Ra Ra Riot with Peter Silberman’s folky Antlers opening @ Howard Gilman Opera House on 2/5 at 8PM. Tickets: $20, 25. Head to BAM's Sounds Like Brooklyn program page for the full lineup and tickets.